The Leonard's Ridge trail is located in the Plateau Division of the Uncompahgre National Forest near Grand Junction, Colorado. 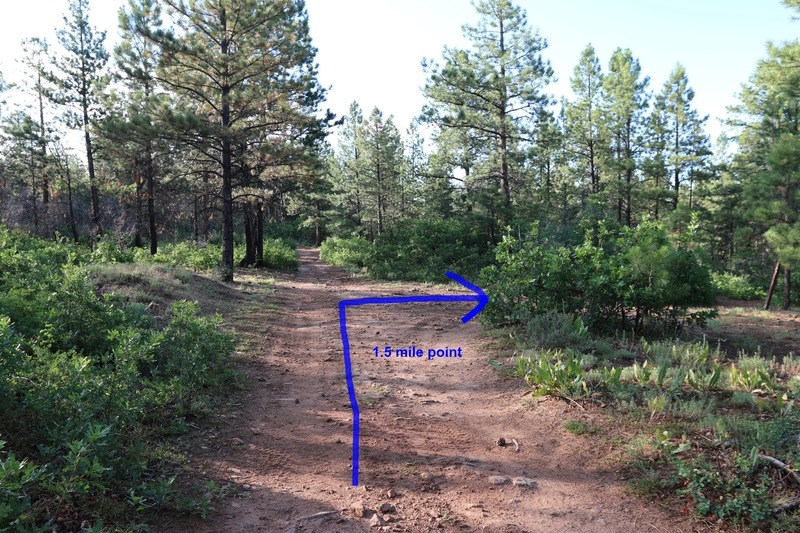 The trail begins on Leonard's Ridge at the end of Forest Road #414.1A where it makes a descent down a draw that starts out steep at first but eases towards the end where it meets up with the Blue Creek and Mailbox trails. At present there isn't a sign marking the upper end of the trail so for practical purposes our map shows the trail beginning at the point where FR #414.1A branches off of FR #414. That ends up adding about a quarter mile to the length of the trail. To get to where the trail begins follow Highway 141 towards Gateway for 14.2 miles from its junction with Highway 50 near the town of Whitewater. Turn left onto the Divide Road and follow it for 15.5 miles and turn right onto the Uranium Road. Continue for another 7 miles to the lower end of Forest Road #414. The last couple of miles will take you down the west side of the Uncompahgre Plateau towards the town of Gateway. The road gets a little steep and rocky in places and could require a high clearance vehicle although a careful driver might be able to manage it. For this post we parked at the lower end of FR #414 and began hiking from there. 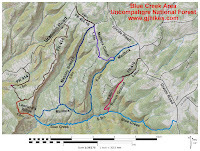 The trail makes a sweeping arc around the basin where it crosses a branch of Indian Creek and angles its way back up the side of the plateau. At the 1 mile point it reaches the spot in this photo and begins leveling off. After another half mile of easy hiking the trail reaches the start of FR #414.1A. The post was just leaning up against a tree so there is a good chance that it might be laying on the ground. Other than a short trail to an overlook at the 1 mile point there aren't any other roads that branch off on the right to confuse with it. Forest Road #414.1A makes a gradual descent that takes it by a pole fence where there is at least one primitive campsite. A very short distance past that the route passes through a trail squeeze where access is restricted to nothing wider than a dirt bike. The trail remains easy for another hundred yards or so as it passes through the widely spaced forest of conifers. About a third of a mile from FR #414 the trail begins a steep descent. The trail is loose and rocky for the next 500 feet before moderating and becoming much easier. The stream that runs down this branch of Blue Creek it more of a trickle compared to the main branch yet the foliage flourishes just as well. Afternoon thunderstorms during July and August tend to keep everything wet and healthy. Leonard's Ridge might be the least used trail in the area but the path is still well worn and easy to follow. The trail comes to an end at a small clearing in the midst of a grove of cottonwood trees. From here you can reach the Divide Road by following the Mailbox trail for about 5 miles. The Massey Branch trail comes up after the first mile going in that direction. 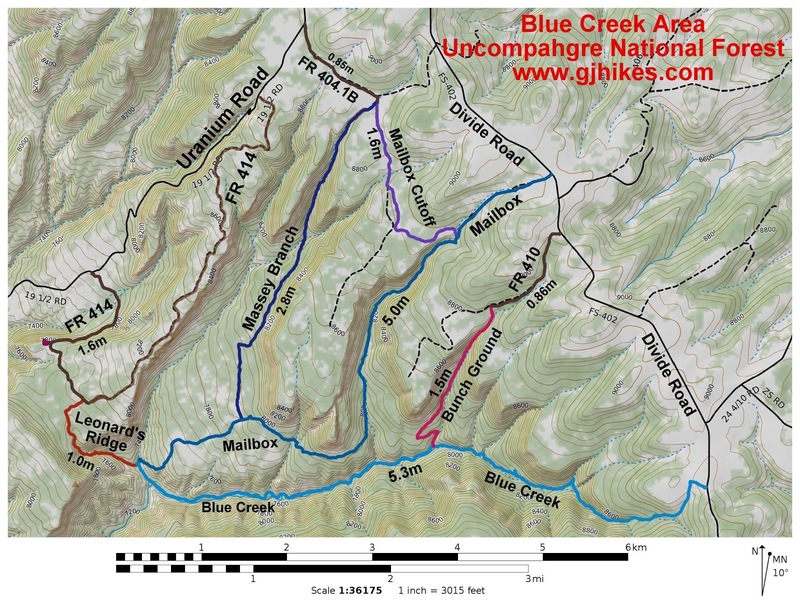 If you follow the Blue Creek trail it is about 5.3 miles to the Divide Road. Keep in mind that the Blue Creek trail is open only to mountain bikes, horseback riding and hiking while the Mailbox trail is open to OHV's that are 50 inches or less in width. The hike back up to the ridge might be easier than it was coming down. At least as far as getting footing through the steeper section of it. It is only a short distance to get up and if you get tired you can stop and take in the views. This hike can be made a little longer by starting at the upper end of FR #414 and traveling along Leonard's Ridge. It is about 3.5 miles going that way from the Uranium Road to the Leonard's Ridge trail but there isn't a lot of elevation change. We saw fresh tracks from one dirt biker that started up Leonard's Ridge from the bottom but turned around at the steep section. I've seen them breeze up a lot worse but that spot probably does take more advanced skills. As far as hiking goes the section of FR #414 that we did along with the Leonard's Ridge trail made for a pleasant outing. If you would like to see it for yourself then all you have to do is 'Take a hike'.